(Hamble, England)- “J/99 #1 is here in Hamble. The boat has the standard single rudder and fixed bowsprit. We took the "all lead" IRC keel option as we like the effect of this keel design on our J/112E GP "Davanti Tyres”. The keel is heavier, deeper, with less drag and more lift. We have now sailed the 99 five times, the most breeze was on the launch day. Offshore on the Solent in 23-25 knots of wind, Dave Lenz on the helm, heated her up and had her sailing at 14 knots under the A2 kite. We were not in race mode, no weight on the rail, with a cockpit full of people fiddling with ropes. So, we know now the new hull shape developed from the 112E, does allow her to get up and go in a manner that just cannot happen on a J/97 in flat water. The loads are a lot less than the J/109. The boat is definitely stiff enough; the wider stern boosts the form stability. The cockpit works well and it feels much more spacious than any of our other J's under 40 feet. The boat is definitely targeted at regaining our position on the doublehanded circuit, as well as working with a full crew of six. The ability to lead all controls to the helm position including the jib/zero/spinnaker sheet. The J/99 gives all of these in a package that is well-mannered and wrapped in a hull shape that has neither excessive beam nor a fat stern with chines. It is no secret that boats with chines are effective in a breeze off-the-wind, but can be very sticky in the light stuff. To win a series, an all-round good performance is very helpful. A large part of the doublehanded fleet is sailing with symmetrical spinnakers. Thus, the boat is designed without the normal J retracting sprit. Boats that are equipped with the optional symmetric pole will also have a short fixed prodder to carry a zero or A-sail. I think that of the 34 orders to date, the split is pretty even between the two spinnaker types. The length of the standard sprit is sufficient for us to sail down to 168 TWA in 12 knots of breeze and, on a reach, it is long enough to keep the boat balanced. 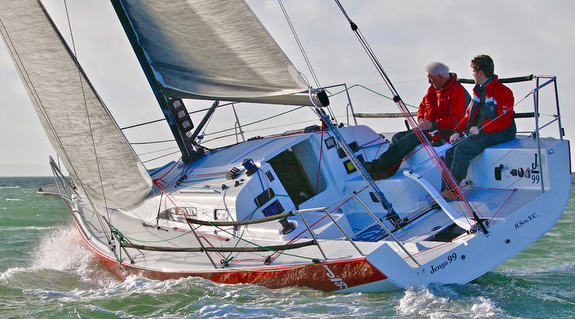 SPI Ouest France on Easter Weekend will be a great opportunity to see how the boat fares in both fully crewed and doublehanded mode. We have from North Sails UK a fluoro-yellow A2 of 100M, black A3 of around 90M, and a cable-less code zero. Interestingly, we find that the range of the cable-less sail is greater than the one with a cable that we have on the J/112E Davanti Tyres. We were sailing at 145 TWA yesterday in 8 knots of wind. We can see that at times of fluctuating wind speed and direction, this sail might get more use when sailing shorthanded than we had envisaged. We have added a second eye on the sprit and a rope clutch near the bow for the Code Zero tack line. Our second spin halyard will be super low stretch to be used primarily for the Code Zero. We have a loaner main and jib from France, made by Technique Voile in La Trinite. They were a perfect fit the first time hoisted. The jib has a very neat soft hank system, which is used by the Figaro fleet, of which Technique Voile boss Fred Duthil is a leading light. The alloy mast is a new custom extrusion from AG+. It is designed to have more stiffness than off-the-shelf extrusions. The mast stands up very well, supported by Dyform wire rigging. Neat details include the fact that, as part of the extrusion, there is a combination mainsail luff track that will handle either a boltrope or Antal 40 slides. Mast wiring cables exit above deck which allows a 100% waterproof internal dam to be installed. The next public viewing will be at Dusseldorf Boot show in Dusseldorf, Germany. Swing by and see us at the stand if you want to chat face-to-face!” Add to Flipboard Magazine.